Discard Studies has created a new resource page for dissertations and thesis related to the field. The partial review below is taken from Dissertation Reviews, a relatively new online publishing venue for freshly minted research (we highly recommend new graduates submit their work). If you would like your or your advisee’s dissertation on the Discard Studies resource page, please contact max.liboiron [at] nyu.edu with the citation and link to its online presence. J. Campbell Cory, The Cartoonist’s Art, 1911. This dissertation focuses on the risk of infectious disease spreading to Victorian milk drinkers, particularly typhoid fever. The author, Jacob Steere-Williams, sees this as a test of the idea that it was specific problems of disease and sanitation that textured the public health response of the second half of the nineteenth century. On the one hand this was a matter of environmental governance, but a great deal also depended on the institutional and individual performances of pathologists, chemists, epidemiologists and bacteriologists. We therefore have here a thesis that is far more than a story of milk. It is a valuable social history of the medical and sanitary context of this commodity. The findings of the research are reported in five chapters. 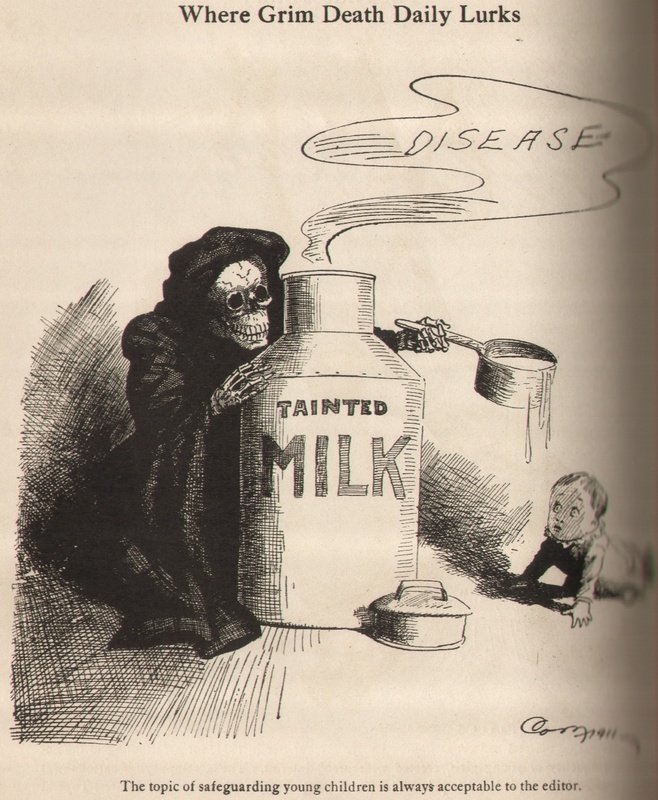 Chapter 1 proposes a link between the anti-adulteration thinking of the 1850s and notions that some diseases might be milk-borne. Scientific food analysis is introduced through the work of Arthur Hill (A.H.) Hassall for the Lancet’s Analytical Sanitary Commission and a distinction is made between the methods of microscopy and chemistry. There are also some preliminary remarks about the MacDonagh model of administrative organization in nineteenth-century Britain and how this provides a starting point for understanding the construction of social problems of the period. This entry was posted in Consumption, Death, Disease, Government, history, Purity/defilement, Sanitation and tagged filth disease, food adulteration, history of science, Jacob Steere-Williams, milk, Sanitation, science studies, typhoid. Bookmark the permalink.